I'm super excited for today's 'Gray's Eats' because...just look at this cake! I love cake pretty much anytime but I must say it's pretty darn meta eating something that was inspired by my work! The creator of this edible work of art is none other than the talented Lindsay of Sprinkles for Breakfast. We were introduced by our mutual friend Rachel, who was sure we'd be able to whip up something fun together! Needless to day, she was correct. Lindsay and I got to chatting and she told me a bit more about Sprinkles for Breakfast. "I started my blog, Sprinkles for Breakfast, three years ago as a way to share my love of baking with the world. I share recipes, tutorials, as well as tips and tricks on how to become a better baker - but my favorite part about baking has always been the cakes. I have always loved the creative aspect that goes into making speciality cakes. It starts as a blank canvas, and little by little it becomes a work art." "A couple of months ago I found myself in a little bit of a design rut. I felt like I was doing the same thing over and over again, and I wanted to try something new. So, I decided to look for inspiration outside of the kitchen and I haven't looked back. I get my inspiration from anywhere and everywhere - just things that I love in my everyday life. Most recently, I have created cakes inspired by music, jewelry, fashion, and now photography! " Talking about what was attracting her to my photography, Lindsay had this to say ..
"There are so many wonderful things about Gray's photography - but my favorite has to be his quirky aesthetic. His use of color, playful subject matter, and unique perspective create a truly imaginative style that shines through in each and every one of his photos." 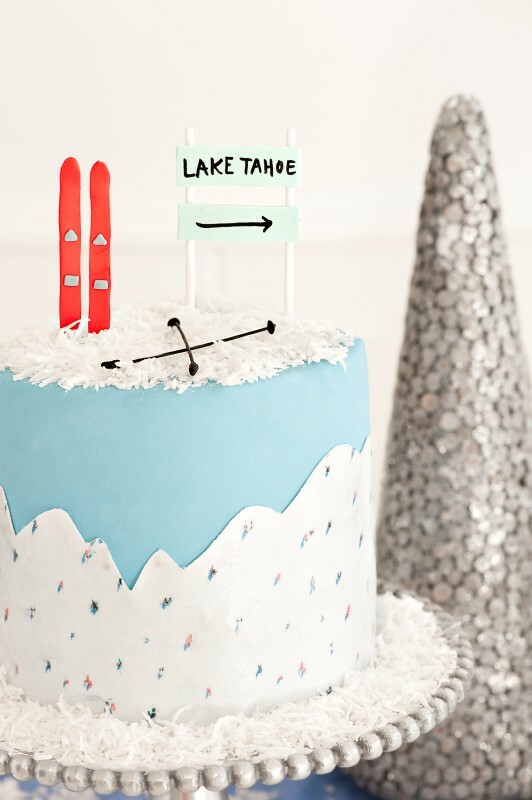 Inspired by this time of year, it felt appropriate to design a cake inspired by my A la Montagne collection, I let Lindsay wild into the series and she chose one of my favorite prints - Lake Tahoe Skiers. Then, to make it that much more exciting, she used my favorite cake recipe for the inside. Preheat the oven to 350°F, grease three 8" cake pans (or four 6" pans) with non-stick spray and line with parchment. In the bowl of a stand mixer fitted with the paddle attachment, combine the sugar, flour, cocoa, baking soda and baking powder. Mix on low until dry ingredients are thoroughly combined. Divide batter evenly between the three cake pans. Bake for 30-35 minutes, or until wooden toothpick inserted in center comes out clean. In a medium bowl whisk together instant pudding and milk. Whisk for 2 minutes and then set aside for 5 minutes to set up. In a double boiler or microwave, melt chocolate. Set aside to cool. In a stand mixer with a paddle attachment, beat butter until light and fluffy. Add confectioners' sugar and cocoa powder and beat until smooth. Add melted chocolate and vanilla and beat until smooth. Add hot water 1 tablespoon at a time, and beat for a couple of minutes until the frosting is smooth and shiny. Once the cakes are cool, take them out of the pans, and place one layer onto a cake plate. 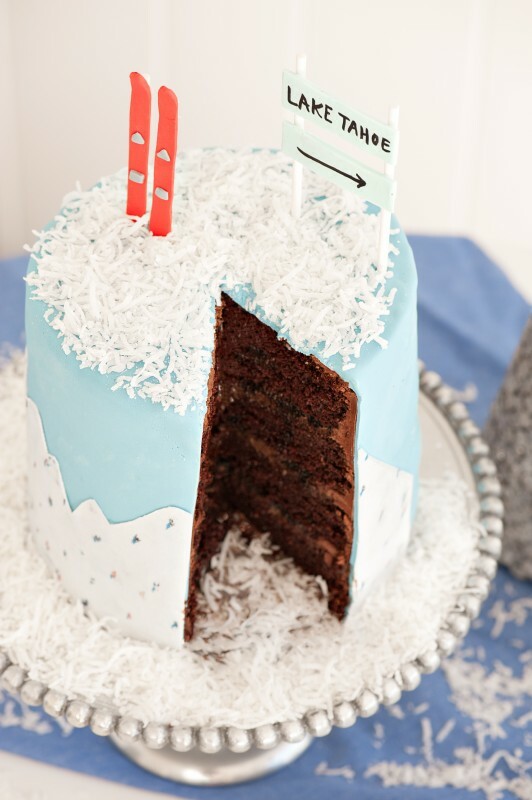 Fill a large pipping bag with frosting and make a ring around the edge of the cake. Fill the inside of the ring with pudding and sprinkle 1/4 cup of crumbs on top. Turn the second layer upside down (so the bottom is face up) and gently place it on top of the first layer. 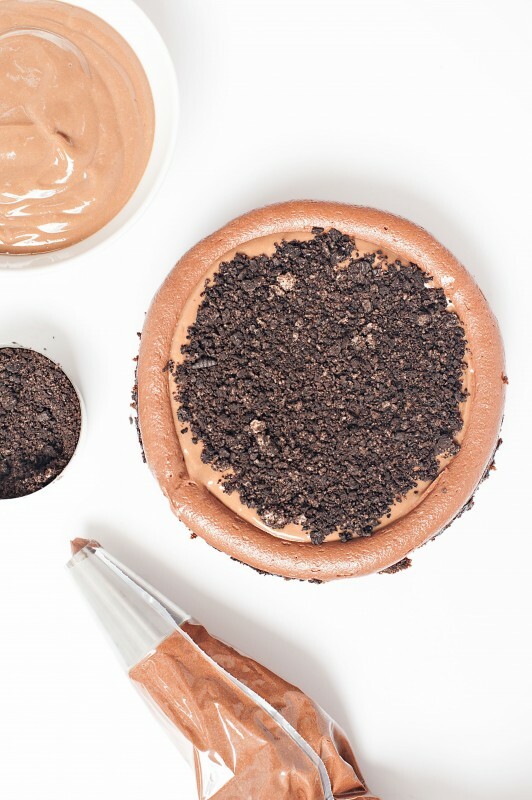 Make another buttercream ring, and spread pudding and Oreo crumbs. Add the third layer (so the bottom is face up) on top. 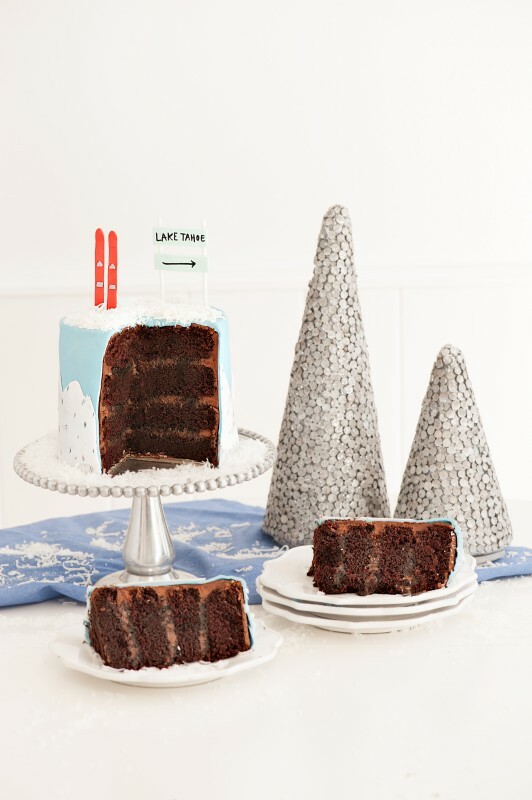 Use the remaining frosting to cover the rest of the cake. *Note - this is the recipe for Dirt Cake. 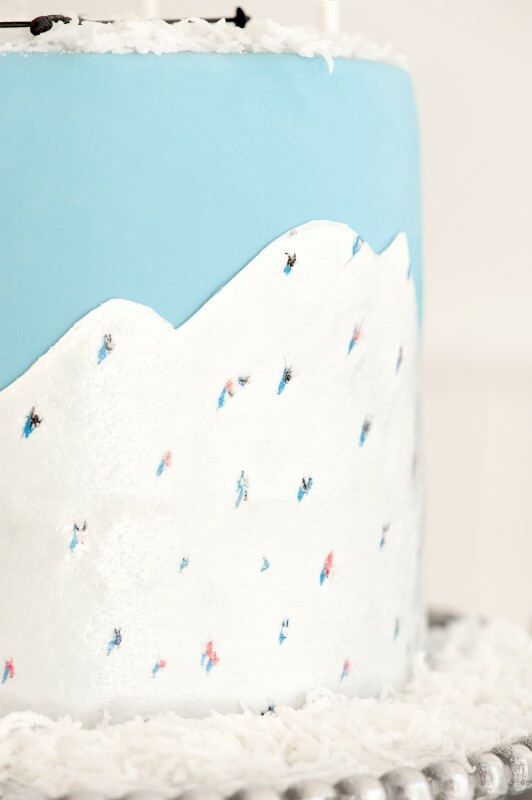 For the beautiful frosting on this cake, Lindsay used covered the whole thing in a sky blue fondant and used the Lake Tahoe Skiers image (printed on edible wafer paper) to make the snow covered mountains. SO COOL. Thanks so much to Lindsay for creating such an adventurous cake! For another fun read, check out what she did with cakes inspired by Taylor Swift songs!